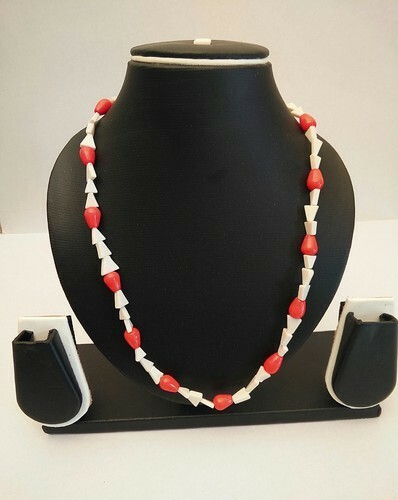 To maintain our goodwill in customers consideration, we are offering an excellent collection of Designer Pearl Necklace Set. This offered array of Pearl Beaded Necklace Set is known for its long lasting shine and traditional look. Trinisus Integrated Solutions Private Limited has conceived its business operations in the year 2010, with its main office located at Mumbai (Maharashtra, India), as an eminent manufacturer of Ladies Necklace Set, Wedding Necklace Set, Imitation Necklace Set and Antique Necklace Sets. Since our establishment, we have attained incredible success in the domain because of our integrity and honesty. Our presented array is crafted using the excellent grade basic materials, latest tools and machines. Thus, our offered array are comfortable to wear and traditional in look. They are easy to use and light in weight. Our offered range is highly admired in the modern market for precious gems used, attractive designs, long lasting shine and quality polished used.